All transactions are safe and secure with a reliable history in online purchasing behind each of our associates. 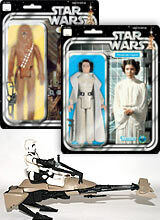 Buy the Vintage Star Wars Action Figures and Original Toys to own Star Wars clothing and merchandise. A long time ago, in a local toy store that is likely now gone, original Star Wars figures lined the shelves for fans to purchase. The release of these now coveted toys not only gave fans and collectors a way to connect with the movie and its characters, it also marked the beginning of a merchandise juggernaut. Here, you can locate original Star Wars figures which encompass the original trilogy and were released between 1977 and 1989. In addition to the Vintage Star Wars Action Figures and Original Toys above, browse the Star Wars Clothing Gallery for more apparel like men's and women's clothes, kids shirts or hoodies.